Making a Pokémon roguelike appeal to two intended audiences has never proven an easy task for developer Chunsoft in the past. For one, roguelikes in themselves are an unpopular genre not meant for everyone. They tend to be brutally difficult, sporting ideas like perma-death and randomly inescapable situations. One wrong move, and you're toast. Back to square one. On the other hand, Pokémon has always been a bit lighter of an RPG with an easy learning curve, strong basic concept and lots of chances to make mistakes and try again. Needless to say, fans of a more challenging roguelike experience might turn their nose up at the difficulty found in a Pokémon iteration of their favorite genre, while Pokémon fans might not quite grasp the mechanics and how they pertains to collecting monsters and earning badges. 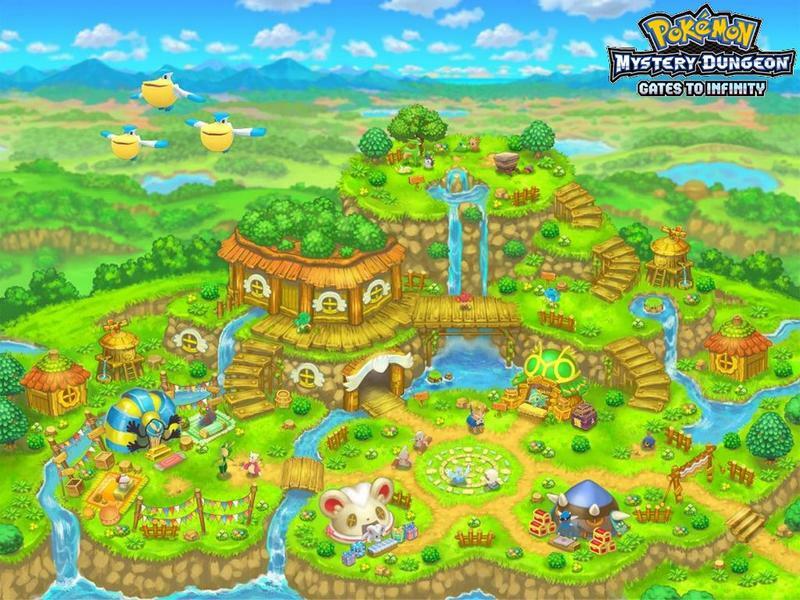 Pokémon Mystery Dungeon: Gates to Infinity does away with all pretension of being a difficult and deep game, catering towards a much more casual audience. But, standing personally as a casual fan of both roguelikes and Pokémon, I say more power to it. As mentioned before, Pokémon Mystery Dungeon: Gates to Infinity sticks to the barebone rules of a roguelike. Randomly generated dungeons set amongst a grid, and each movement performed by the player's avatar acts as a turn for the entire world. Random treasures scatter the floor for easy pickings, but enemy Pokémon also share the universal turn and will attack relentlessly if given the chance. Tied together with the basic dungeon crawling system are all the traditional Pokémon mechanics, so longtime players should have no trouble jumping in. Pokémon can only know four moves, and PP determines their usage. 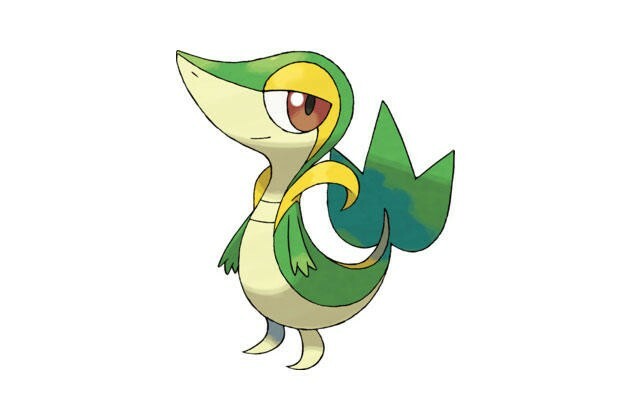 Grass is weak to fire, and electricity is still Super Effective against flying and water. We've played through this rock-paper-scissors style game enough times to know when a Pokémon is at a severe disadvantage or not. Gone is the perma-death. Gone are the hopeless situations. Pokémon Mystery Dungeon: Gates to Infinity is not a game out to challenge you through grueling dungeons, although secret options do exist. It's a game about collecting items, expanding your friendships with other Pokémon, and uncovering new secrets within the dungeon. Those looking for a harder experience might turn to the vast array of freeware PC options out there instead. It's a Pokémon about friendship and hope. How can you tell a story about "hope" when there is little "hope" anyone will complete it? How can you tell a story about "hope" when there is little "hope" anyone will complete it? Charged with the task of revitalizing hope in the Pokémon world, your avatar and another companion set out to create the ultimate Pokémon paradise for others to aspire to be part of. The world is in danger of collapsing under distrust and hostility towards one another, and only true friendship between Pokémon can save it. The tacked on and childish story is necessary to set up the main purpose of the game, so it's best to pay it no mind. One could even assume that just doing away with the story altogether would improve overall quality. Dialogue and cutscenes often drag on and on, with characters often saying the same thing twice in a row, just worded differently. Tutorials take forever to complete, and some, like the dreaded V-Wheel mechanic, are explained every single time they are used. Two or three examples are provided for each mechanic and shop in the town. If children often don't understand the first time they are explained something, then Pokémon Mystery Dungeon: Gates to Infinity's solution to getting its core audience to understand is to simply lay it on them as thick as possible by repeating every line in the game. Adults who want to play this game will be craving for the ability to skip cutscenes, but to no avail. There is little to no option to skipping all the chattiness which happens in this game, and that only makes it much more painful considering how this awful pacing makes it so much more difficult to get back to the game's main allure, building Paradise. Paradise consists of shops and facilities scattered throughout the property your avatar has purchased at the beginning of the game. Touring dungeons and completing quests given by your citizens unlock materials, which can be used to expand your land and build new buildings. This in turn allows more Pokémon to move in and more quests to become available. 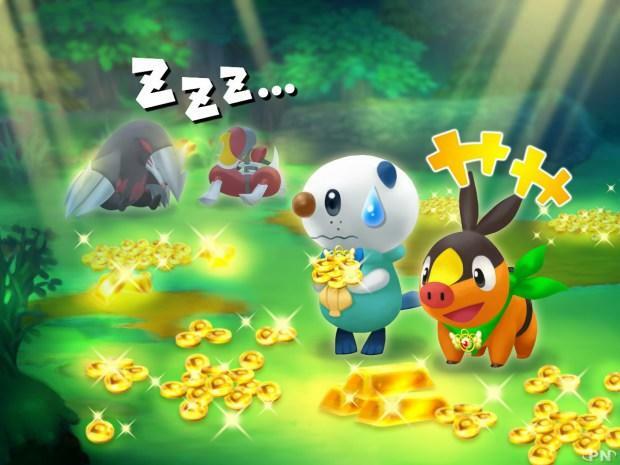 With such an easy approach to battling and collecting materials, Pokémon Mystery Dungeon: Gates to Infinity actually succeeds quite well in creating a sense of "just one more turn." Almost finished with that Electric Dojo? Just one quest will get the needed materials, but when getting those materials, your favorite Pokémon just might level up. That level up will take just one more quest, which will again lead you to be one material away from building yet another fun and exciting shop. And a groove is established, another layer is added to the puzzle. Certain conditions allow some Pokémon to level faster. Some treasures unlock secret areas deep within the dungeons, which allow for more facilities to be built and Pokémon friends to join your cause. Before you know it, Paradise is before your eyes, and there is always something new which can be done. It's almost like there is no end game. Now it's easy to see why those long dialogue scenes can be so frustrating, Quagsire mumbling his way through his lines. The drive to complete, explore, and get just one more thing done is hampered by a needless plot when it should be the main driving force of the game. I've dabbled in Chunsoft's Mysery Dungeon: Shiren games a little and have spent way more hours than I care to admit bumbling around in Azure Dreams, butPokémon just seems like a natural fit for the genre. If this is considered a jumping in point for newcomers given the relative ease of the dungeoneering, consider me intrigued to check out the backlog. Pokémon Mystery Dungeon: Gate to Infinity is not a game I will probably play again, but it does do a fantastic job of getting me hyped for Pokémon , roguelikes, and other games in the series. If I had any detrimental experience with the game, it's that I've been far out of thePokémon world for too long and didn't recognize any of the characters. Perhaps familiar faces will only make it better. We were provided with a free copy of Pokémon Mystery Dungeon: Gates to Infinity by Nintendo, and logged in roughly 15 hours of gameplay before writing this review.